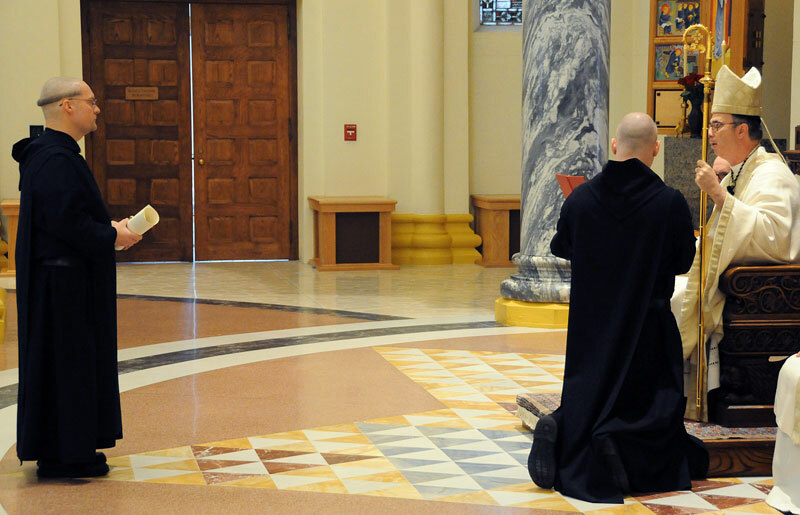 Benedictine Brother Francis de Sales Wagner professed his solemn vows as a monk of Saint Meinrad Archabbey during a liturgy on Jan. 25 at the Archabbey Church of Our Lady of Einsiedeln in St. Meinrad. He is a native of Findlay, Ohio, where he was a member of St. Michael the Archangel Parish. He earned a bachelor’s degree in journalism at Bowling Green State University in 1988. After graduation, he worked at The Galion Inquirer in Galion, Ohio, until 1996 as a staff writer and later as the managing editor. From 1996-99, he worked at The News-Sun in Springfield, Ohio, as a copy editor. He also worked at The Blade in Toledo, Ohio, as a copy editor and wire editor from 1999 to 2006. He joined the monastery in 2007 and made his first profession of vows in January 2008. Brother Francis is a writer and associate editor in the publications division of Abbey Press, and is studying for a master’s degree at Saint Meinrad Seminary and School of Theology. He also is a conference presenter for the Benedictine oblate program, and presents retreats to guests.